Published on April 3, 2016 by Wade Shepard Follow me on Twitter here. My first day in Dhaka I thought that I would act professional and hire a car to go to my meeting. But this plan backfired fabulously. Rather than zipping across the city at a speed worthy of a vehicle propelled by an internal combustion engine, a half hour later I found myself sitting at an intersection hardly two blocks from where I was picked up. All around me was a melee of gridlock. 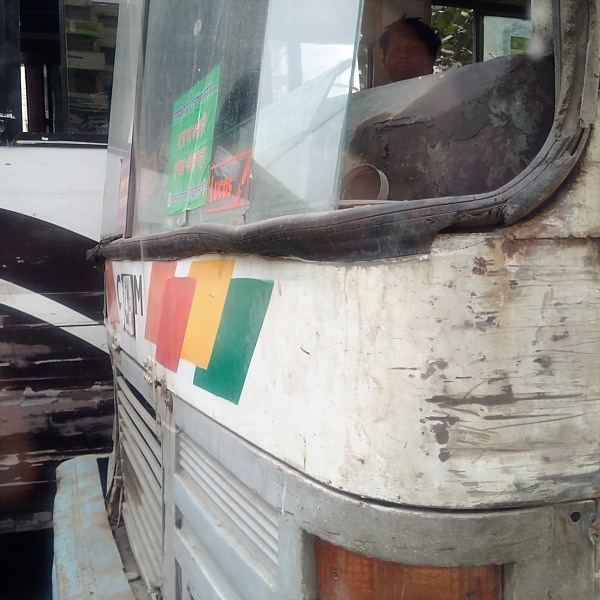 A battle scarred bus to my right would creep forward a tire rotation every two or three minutes, a tuk-tuk driver to my left stared idly into the screen of his phone, while my driver engaged in an extended haggling session with a street vendor over the greasy front axle he was trying to sell to people sitting in idle vehicles. Nobody was going anywhere. I inched my way across Dhaka, ultimately covering a few kilometers in nearly two hours. Dhaka has been called the traffic capital of the world, and the World Bank has asked if it is even possible to build the city out of its traffic congestion. 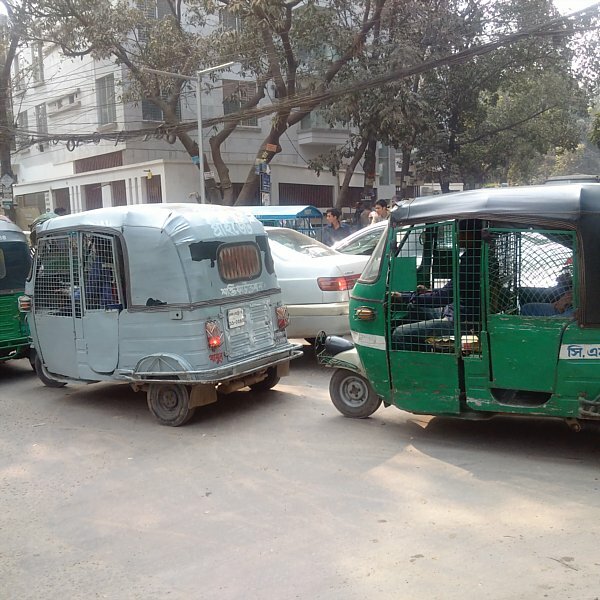 The traffic problem in Dhaka has been going on for 10 to 15 years. This is nothing new. The start of the globalism age dumped an overflowing deluge of cars into streets that simply were not made to contain them. Carrying capacity was quickly met, then exceeded, then exceeded some more until the city became what it is today: completely broken. “Dhaka is a totally unplanned city,” spoke the marketing director of the Asian Age newspaper as we sat entrapped in their company vehicle in a stagnant puddle of un-moving traffic later on that day. My first couple trips around Dhaka I made a newbie faux pas by asking in advance how long the rides should take. This was always the reply. Complaining about the traffic in cities undergoing the first wave of globalization can come off as cliche. The traffic is bad everywhere in South and Southeast Asia. But the traffic in Dhaka was really something special. Easily, it was the worst that I’ve seen in 16 years of travels that have often been centered on developing countries. The place just doesn’t work. This isn’t only a major impediment to life but business as well. This isn’t a place that you can fly into, have a business meeting, and then fly out. No, it can seriously take a quarter of a work day just to get downtown from the airport. It is simply impossible to get anybody or anything around this city efficiently — including workers, who must cram into the urban core because they can’t live in the suburbs if they want to make it to work at some point during the day. You can’t quickly get products in and out, the entire supply chain of the place is perpetually disrupted. You can’t even plan a meeting and expect it to actually begin anywhere near the start time. Workers here often find themselves stuck on the road instead of inside their offices during work hours, and many have simply adapted by working in their cars. A friend there told me that he specifically hired a driver just so he can get work done in the passenger seat when stuck in traffic for hours and hours. The mobile office here is being taken to an entirely new level. There are financial repercussions to this traffic as well. In terms of pollution and delays alone, the cost of Dhaka’s traffic congestion is estimated to be $3.8 billion per year. 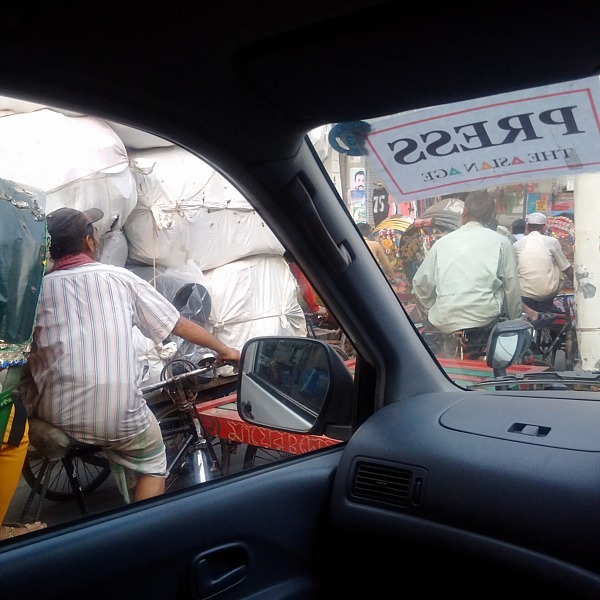 If you ask someone in Dhaka what the country’s biggest issue is they probably won’t say sweatshops or sanitation or education or any of the other things the NGOs like to go there to fix, but traffic. 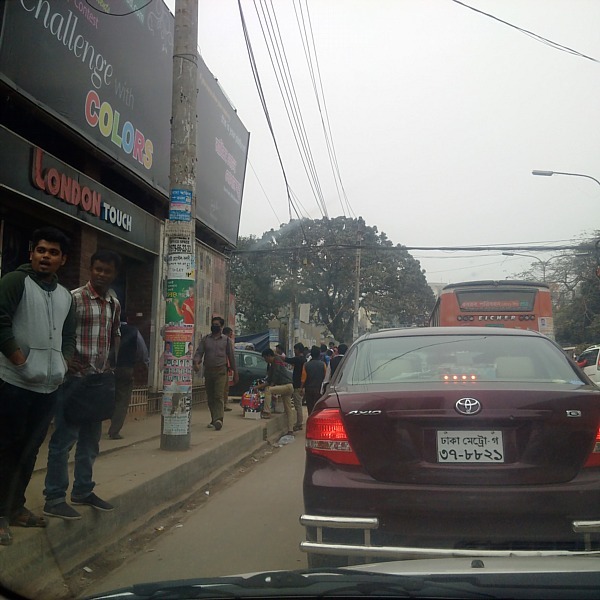 Dhaka’s traffic problem isn’t something that the people there are so accustomed to that they view it as normal — no, they know it’s fucked; they know that cars are supposed to move faster than pedestrians. There will be 21 million trips made in Dhaka today. Buses, cars, tuk-tuks, bicycle rickshaws, and pedestrians all compete for road space. Navigable sidewalks are rare — even where there is a separate sidewalk it is often used as parking space for cars or is in such disrepair that it is more dangerous to walk on it than in the road. As I sat in traffic at an intersection in the consulate zone I was able to make a video of some guys installing an electrical line from start to finish. They were pulling wires directly over the cars without regard for the fact that they were mobile entities that could move at anytime. The entire installation process took around 10 minutes, but they didn’t seem worried that they were working right in traffic. They knew we weren’t going anywhere anytime soon. I watched as pedestrians were able to move around the car I was sitting in and on towards their respective destinations, and I found myself envious. The next time I go somewhere here, I promised myself, I too will walk. Dhaka is probably the only city in the world where being given a lift is an inconvenience. Flyovers are the great solution the government has come up with here. So huge concrete elevated overpasses are being constructed all over the city. They are national projects and seem to be used as a way of showing “the people” that their government is responding to one of their biggest needs. All over the partitioning walls of these construction sites are pictures of the president and slogans about glorious futures and all that. 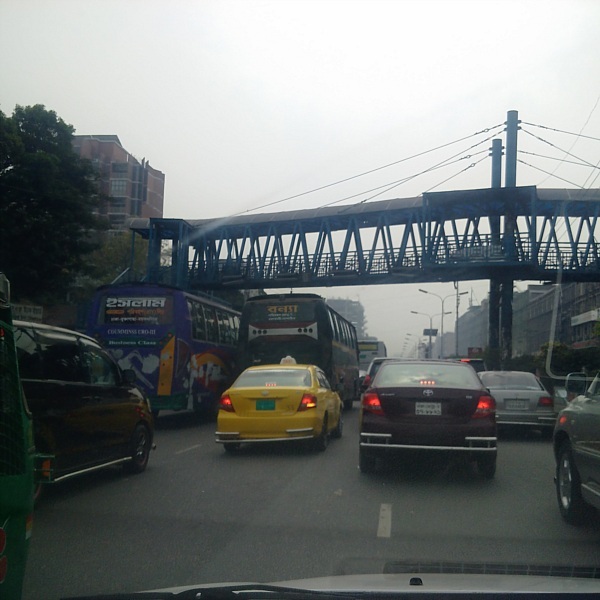 However, many urban designers and lay people in Dhaka seem to view these fly-overs as redundant and obsolete half measures rather than a true fix for the core problems. “The problem is all the trucks and buses on the road but the trucks and buses are too heavy to go on the fly overs, so why build them?” one resident queried. For many years, many cities in the world did try to build more roads to relief traffic jams after motorization took place. However, no city has been able to build itself out of congestion. In fact, allocating more urban land to roads means you have to reduce the portion of land allocated for other urban functions, such as housing, industrial, commercial and entertainment. What has also been widely recognized is that building more roads does NOT reduce traffic congestion. It would actually induce more motorized traffic and thus create more traffic congestion. The irony of Dhaka is that it’s rapid development and progress has led to its biggest barrier to development and progress. This is a city that has developed itself into gridlock, and unraveling this knot defines the place at this juncture.